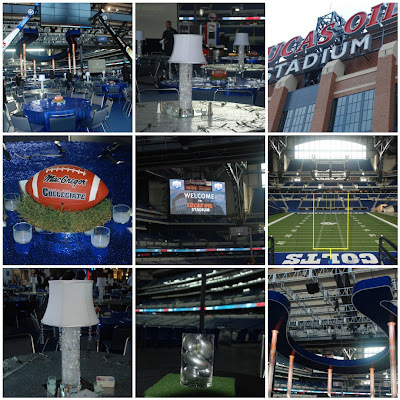 Lucas Oil Stadium was the incredible backdrop for our Blitz & Glitz event. The mezzanine was set with lots of tables dressed in sparkly blue and silver linen overlooking the Colts playing field. Half of the centerpieces were footballs with real grass in sleek silver bases and the other half of the centerpieces were glitzy lamps. The base was filled with acrylic diamonds and the lampshade dripped with chandelier drops and the entire piece was lit with blue lights. The built in stage is an amazing sculpture in itself. It’s the iconic horseshoe shape with lighted columns. The guests toured the locker rooms, field and stadium then they were treated to a served dinner. This entry was posted in Colts Party, Football Party on September 27, 2009 by Setting the Mood. Tackling Homelessness is Horizon House’s major fundraising event. Not only is it a fun event, it is for a fantastic cause. The Horizon House is a place for our homeless neighbors to go to help get them back on their feet. They provide, job training, clothing, food and support to those in need. 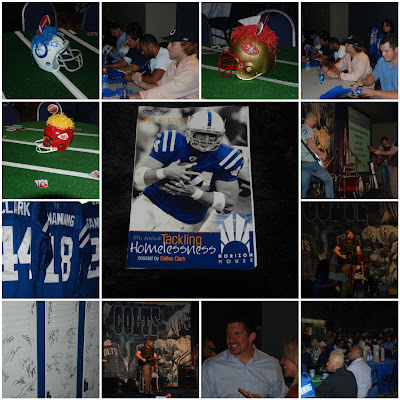 This years event was hosted by Dallas Clark of the Indianapolis Colts. Many Colts players showed up to sign autographs, take photos with patrons and help raise money. Connersvine (Hunter Smith’s band) provided awesome music for the evening. Setting the Mood donated the decor for the event. This entry was posted in Colts Party, Football Helmet Centerpieces, Football Party on September 7, 2009 by Setting the Mood.